The Wine world is here! 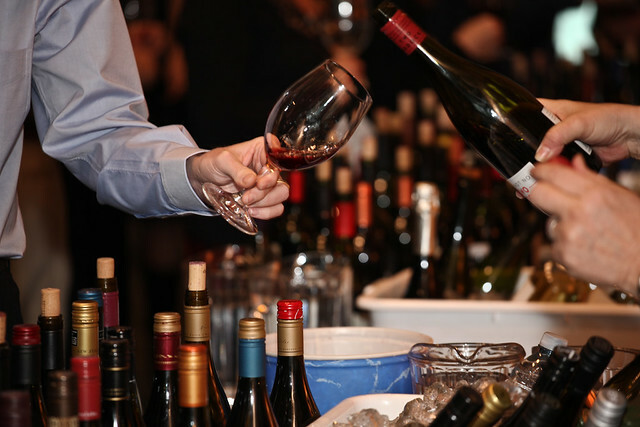 The Vancouver Playhouse Wine Festival is back again, matching wine drinkers with the world’s greatest winemakers in a weeklong celebration of wine and food from March 28 – April 3. If your into wine, this is THE place to be with a display of 1,650 wines, 177 wineries, 15 countries and 62 events over a 7 day span. This year’s 33rd annual festival is estimated to bring in over 25,000 attendees – it’s largest audience ever! During the week there will be dozens of events from wine tastings, multi-course lunches and educational seminars. Although it goes without saying – nothing beats the wine tasting room. Once you walk in, you’re handed an empty glass and given a license to start sampling. Everything is on display and nothing is off limits. Sample the very best of wine, port, rosé, sparkling, erlot, champaign and plenty more! The theme of this year is wine from Spain. The global focus is: fortified wine. Spit buckets are available…and optional. For this year’s festival, be sure to check out the event listings and purchase tickets in advance as they usually sell out leading up to the event. But if you’re feeling lucky, just enter our contest! The Pan Pacific Vancouver will be giving away 2 tickets to the wine tasting event on Friday April 1 from 7-10pm. I want to win 2 FREE tickets to the Vancouver Playhouse Wine Festival from @panpacificvan and @playhousewine http://bit.ly/gkqYxB OR2) Leave a comment below and tell us why YOU deserve to go to this year’s festival (we’ll pick a random winner). 3) Do BOTH for an additional entry! 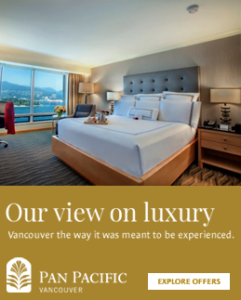 Also remember from March 27 – April 27, the Pan Pacific Vancouver is offering a luxuryroom rate of $119 a night for social media followers. If you plan on attending the event, the Hotel is located only footsteps away from the Vancouver Convention Center. For more information on this year’s event, download the 2011 festival brochure or check out my recap from last year’s event. I would love to win the tickets because we just started to get into wine in our household this past year and have no clue or education on what is good and why. So this would be an amazing opportunity to learn more about the wonderful world of wine! I typically don’t “taste” wine, just drink it…so this would be a great opportunity for me to become more educated and classy! I would love to win tickets as I am a big supporter of the wine trade and I keep my readers informed of all the tastings that occur on a daily basis. I would love to win these tickets!! A fabulous night out sampling the finest wines of Spain would be a dream come true for me and my husband – and winning the tickets would be a great way for me to surprise him with something special!! I would love to win tickets and learn more about wines, especially those that are outside of BC! I love wine and would love to win tickets! Wine is in my blood (I’m Italian), so I totally deserve to go!! Would be nice to go to this event and try some different wines. I would love to go to the wine festival! I’ve never been to one and I want to go so I can take a lot of photos! I have never been to the wine festival before but would love to go and celebrate my anniversary with my boyfriend by winning tickets and taking him! I luv wine…no more needs to be said! Whats not to love at such an event !! I would love to take my wife there with those Tickets!!!!! I’ve dedicated this is year to educating and elevating my palette so I’d love to win two free tickets to the Wine Festival. I would love to win tickets as I am a big supporter of the wine and I am trying to get myself into the wine industry so this event can help me obtain more knowledge. would love to refine my palette with the assorted wines that I’m sure will be there at the festival. I would LOVE to win tickets! I’m the manager of a restaurant and I love learning about wines. Playhouse is the ultimate expierience! Would love to taste the night away at the Wine Featival! I would love to go for my first time. I am not that educated in wine, but I love Spain, so it seems like the perfect way to learn about wine. Thanks for having this contest! Even though I have zero knowledge about anything to do with wine culture, I still want to go so that I can pretend that I’m a pimp for a night. would love to win! would be a great time! Would be a wonderful wedding present!! I LOVE Pan Pacific!! Would love to experience the wines from around the world as I don’t have the money to travel the world ! A new wine lover and have so much to learn, so a great experience for my husband and I and a great date! I love promoting your hotel to my clients and “pair” that with a wine festival, sounds like an amazing week-end! Because I’m a Wine-o and would love to taste some different and exciting new wines! I have never been before and would love to check it out! Because my “good” cholesterol needs to be raised and drinking wine can do that. I have stayed many times at the Pan and love it as wine just as much. I think more people from out of town like the Sunshine Coast where I live and Vancouver Island need to re-discover the Pan Pacific Hotel and Vancouver!!!! My friend and I are learning Spanish…wine from Spain? It’s meant to be. Please pick me because I LOVE WINE. I don’t need any other excuse to come to your event. Love Wine! Would love to learn more about the different kinds available and what better way than to get to do a “wine tasting”. Perfect! I would love to win free tickets because i would like to experience an event like this for the first time. I have only gone to wine tastings and enjoy it a lot. This will certainly broaden my knowledge about wine to another level. I would love to win two tickets to this fabulous Wine Festival. I deserve to go because I am enthusiastic, friendly, cute, and single. The last time I went to this event I married my date- the possibilities now are infinite. Like a fine fortified wine, I’m aging well and am more delicious with time. I would love to win it is right in the middle of my busy season and I could you a night of Wine!!! going to this festival would be truly amazing experience. I live in wine country, Okanagan, but never get to experience the wine culture. I would love to take my son who is a wine lover to see what this is all about. I’ve never been and I’m really keen on expanding my wine knowledge / appreciate locally and internationally. I am also waaay overdue for a serious break and couldn’t find any KitKats (overrated! ), so would love to participate in my first wine tasting in ye fair Vancouvertown, and sample the best vinos the world has to offer!! And what better way to do it than here. I can learn about Spanish wines in preparation for a trip to Spain (hopefully) next year! Who wouldn’t want to sip wine in the most beautiful hotel in the best city? I would love these tickets, it is my boyfriend and I’s 5 year anniversary the first weekend in April and it would be amazing to go to the wine festival to celebrate! I would love to go to this and stay at the Hotel for the weekend it looks like lots of fun, tasting all diferrent wines and meeting different poeple. yes it is exspensive but its well worth it .hotel staff make u feel so welcome. Life is large and I deserve to go to the Vancouver Playhouse International Wine Festival because I put the effort in and want to experience the best the wine world has to offer. Drink, Stay and I promise to be merry if I win two free tickets to the Vancouver Playhouse International Wine Festival! Thanks for giving us the opportunity to enter this contest! We don’t get out of Surrey too often. It would be great to have a night out in the BIG city. I’ve never been to the wine fest before because I’ve never been able to convince a friend (or myself really) to pay the entrance fee. This would be such a treat! Especially as the feature is fortified wines! I love port and dry sherry, but clearly have a lot to learn by trying madeira. Salud! Good wine, good food and good friends are the essence of a great life. This event could inspire me to take a wine tour vacation, hope I get a chance to go and get inspired. Ironically, as a wine lover, I’ve never been to the Vancouver Playhouse Wine Festival. I’d love the chance go experience it! 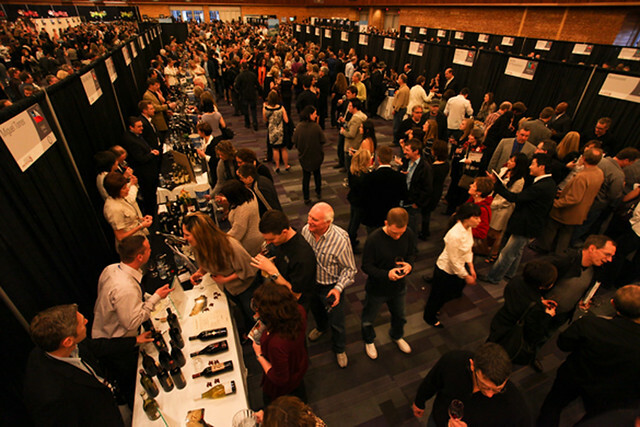 I am very interested in the Vancouver International Wine Festival 2011. Every vacation, dinner party and about town – is around our love of wine! i’ve never been to a wine festival before and would love to go! Would love a MUCH needed break before heading into finals! I LOVE wine, food, and mingling with the people who know how to pair these all together! Had a chance to check out some beautiful wineries in California and the Okanagan during the last few years and this wine festival here in Vancouver looks so amazing and I would love to be able to attend. I hope you consider me for this AWESOME prize! I would love to win the tickets! My new husband and I didn’t get a honeymoon and with a three year old son at home, this would make for a very special rare occasion! My husband and I have always wanted to attend a playhouse winefest event, and never have had the chance to go and or didn’t feel we could afford to. We will be celebrating 25 years to marriage in December, 2011. We are currently looking into a second honeymoon possibly to Spain and Portugal, in the next year. Attending the winefest could possibly entice us to book that flight to Europe!!! It would be great to be able to sample from such a large collection of wines. In addition, my friend loves various wines, but has never had a chance to attend such a large event. I think it would be great. I love wine and would really like to try some new brands! We traveled from the other corner of North America (Florida) and really love wine! It’s my husband’s birthday, he loves wine and the Winefest would be a real treat for him! We are new to Vancouver and would really enjoy mingling with that many wine-lovers in one place! I work in the service industry and wine is my passion. Free tickets would be the icing on the cake for a weekend of education and tasting! I love wine and love trying new wines, so I deserve to win…Please!! I would love to win tickets to this event so I can expand my wine knowledge to wines from around the world! I deserve to go to the Wine Festival because I would take my MOM for a fabulous night out! She’s the one who really deserves it! I deserve to go to the wine festival because I’ve never been to one. It would be really great to have the opportunity to sample a many different types of wine without having to buy whole bottles of them! I just started drinking wine last year and it’s something tht everyone should include in every meal or social gathering. I would love to expand my knowledge of the various wines out there and would take fully opportunity of this event if I was chosen. Thanks! Have never been but would love to go! Spanish wines? Hook me up. My wife and I had an amazing time in Spain years ago and trip to the wine fest would be a great way to relive the Spanish flavours. I’d love to go! Sounds like a fun way to spend the evening with my favourite sister! I would love to go! We have had a lot going on in our lives lately and need a night out to enjoy ourselves along with sipping amazing wine! Fabulous HOTEL -fabulous LOCATION-one of the best festivals Vancouver Hosts. I would love tickets to this! It is one of my favourite events in Vancouver and I look forward to it all year. I have never been! Would love to check it out! I would love to win two tickets to see the Wine Festival, as I’ve been wanting to go for years. I even have the day off on Friday, but it turns out the night is now sold out! This year would be perfect too, as I love fortified wines. I’ve never gotten to go! The lucky winner of 2 tickets to the Playhouse Wine Festiva is Alysha Rohla!! Alysha entered the contest via Twitter at: @alysharohla. Congrats Alysha!! Be sure to check back on the blog for our next contest! I’d like to win the tickets as a gift for my Mom and Dad because they love wine and I owe them big time! I’d like to win the 2 tickets to the Wine Festival because although I’ve always had a chance to volunteer there (and I have), I’ve poured out my fair share of wine from buckets, cleaned up after others and even offered directions and advice… I’ve never had the chance to just enjoy the festival on my own as a patron. It was always too much money. In fact, I started organizing my own wine tastings as a tribute to sharing my love for wines from around the world and these were used as fundraisers – all proceeds went to charitable causes like the Tsunami and Red Cross (Haiti). It would be nice, for once, not to have to work an event and just be able to enjoy. Thanks for putting this together! If I were to win this contest, you would help me cross off 2 very important dreams of mine.